What are your habits with buying Chocolate? Are you those who pick up unique treats from a faraway land, piling them up only to use them for something show stopping? Could you be one of those impulsive buyers who picks up the candy bars from the checkout, petrol station stashing them in a private box for comfort? Maybe your one those who snob anything that is less than a 35% cocoa butter and then under 70% is too sweet. I am neither one nor the other in this situation because I fall into the last category of chocolate shopper. As cheap as this might be anytime there is a sale on the high quality chocolates or high cocoa butter chocolates, I am on it like a fly to honey. 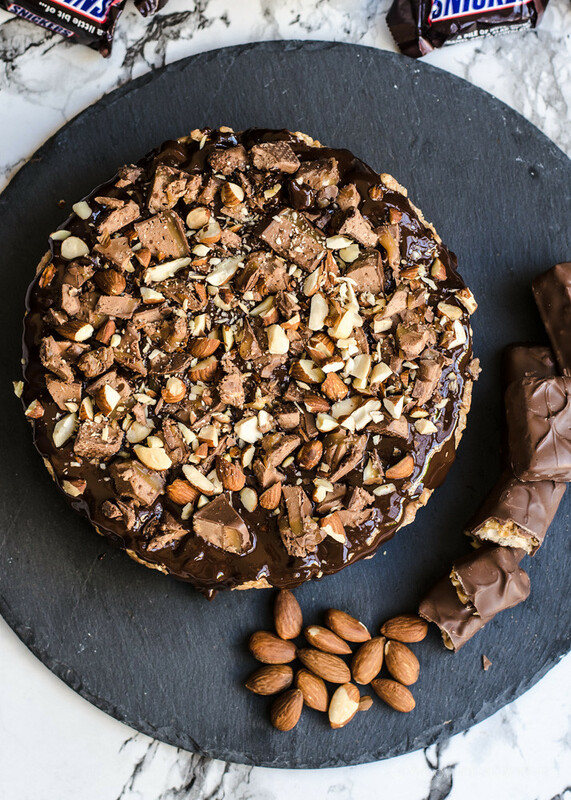 It doesn’t even have to regular block chocolate. Easter chocolate, Christmas chocolate, Halloween chocolates; the list goes on with the amount of chocolates being marketed to as gifts. All chocolate is equal when it melted into a delicious molten pool of re tempered chocolate. However I almost never buy chocolate a full price; unless I am using them in ganache for fondant covering cakes or my very special dark chocolate. I justify my buying habits as saving money because I always seem to be eating my chocolate as I am cooking it. In all honestly it is probably my hoarding in a controlled sense; what can I say I had a long break from eating chocolate at one point in my life. Of course this does not cover my habits with buying breakfast cereals where I probably have a collection to rival Christina Tosi. Currently I have 10 types of breakfast cereal in my pantry not including the single grain “health” muesli and un cooked oats. Yes these are all just for me! My mum hardy eats these cereals. I call it my cereal addiction but really it just practical. So I am currently fueled by cereals and coffee for a majority of my teens to now. Do not judge! How do you think the crazy ideas come from? So this Halloween I guess I had the idea to try and combine the two. While this holiday is not my favourite on the list, it does provide lots of chocolate and lot of candy. These are my adult party treats which have all kid loving taste. 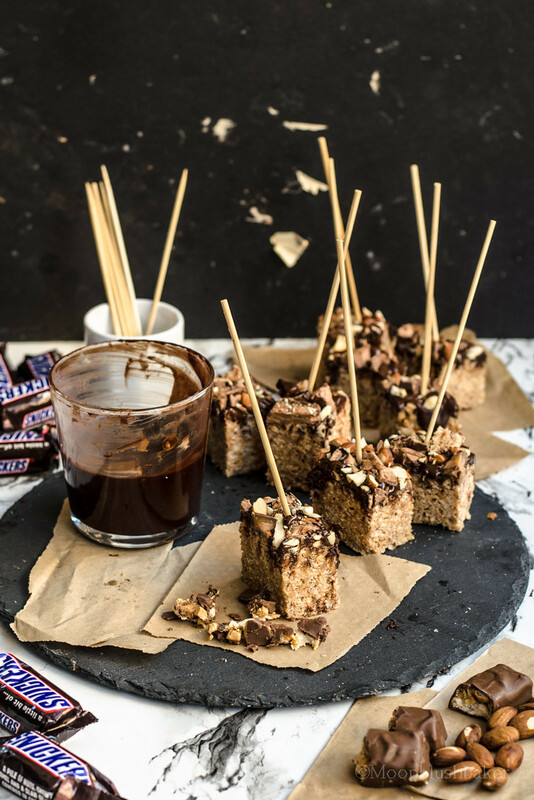 If you are too embarrassed to admit you love rice crispy treats or ICMs (if you are in Australia); never fear these are fancy enough to serve to even your snobbish guest. The combination of rice bubbles in a cereal bar have long been a lunch box favourite as a small child these were my favourite snack to find in the box. While those days have long past that I pack a lunch box; my love for crispy bar will never die. These were my first taste crispy treat in about 5 years. Sad I have been separated from this from so long. 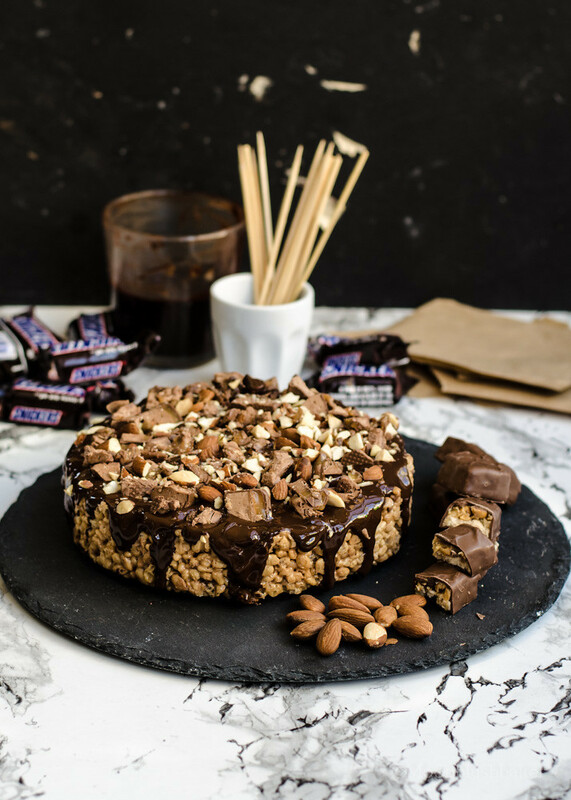 Snickers are always a winner; the crunch of peanuts and the oozy caramel that dips from the edge of thinly coated milk chocolate. The pillow, sweetness of marshmallow with that powder corn flour outside; charred under the grill to make sure you get every bit of raw flavour out of them and replace it with warming smoking under tones. Combine them with your rice bubbles and push into the pan of choice. 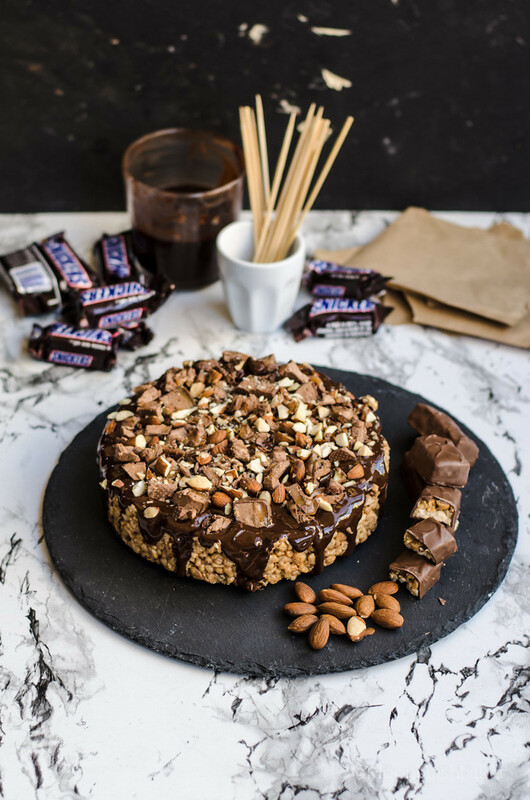 Finally top with a layer of chocolate and top with more nuts and snickers; a beautiful sight. Cut into bite sized pieces and serve with a store brought chocolate sauce (yes I buy stuff too!). You can actually get good sauce in stores now that have a high percentage of chocolate in it with a cream. However you can make your own if you are bothered. 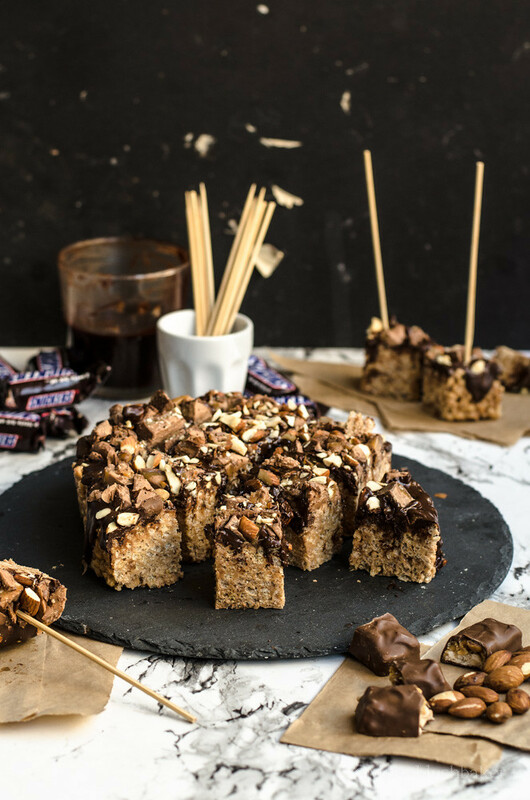 From child hood treat to adult party snack; you have dessert canapé of dreams! Pre heat your broiler. Line a baking tray with grease proof baking paper. 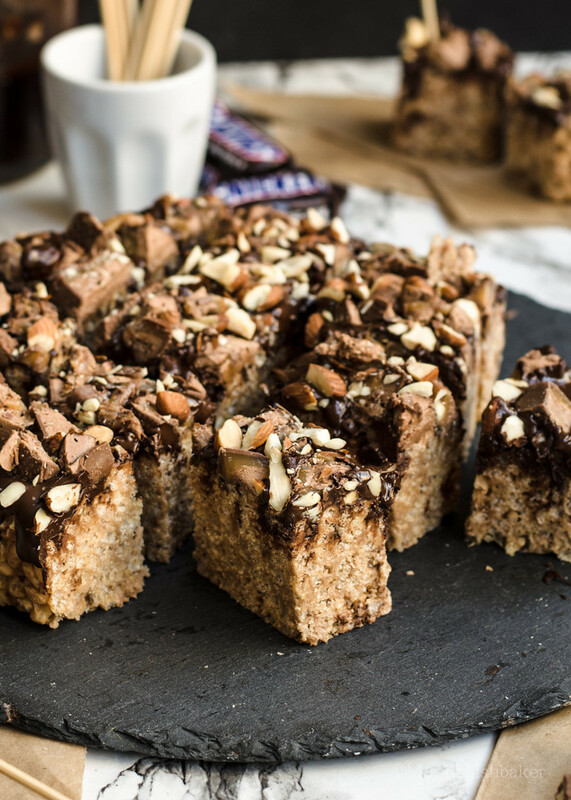 Place marshmallow and chopped snickers bars in a single layer across the baking paper. Toast until golden brown or dark brown. Place rice bubbles and salt in large bowl. Combine. Tip the melted marshmallows and snickers in to bowl with melted butter. Combine with grease spatula then tip in the large bowl with cereal. Mix until homogenous. Straight away tip and push into the time of choice. Fridge for 30 minutes or until set. 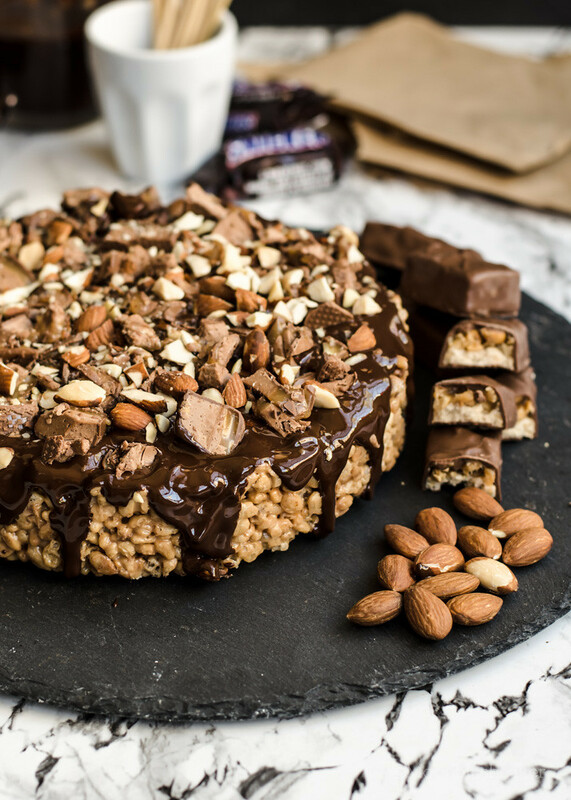 Remove crispy treat from fridge 1 hour before ready to serve Melted chocolate over pan of simmer water. Set aside to cool. Pour over the chocolate to coat the top well. 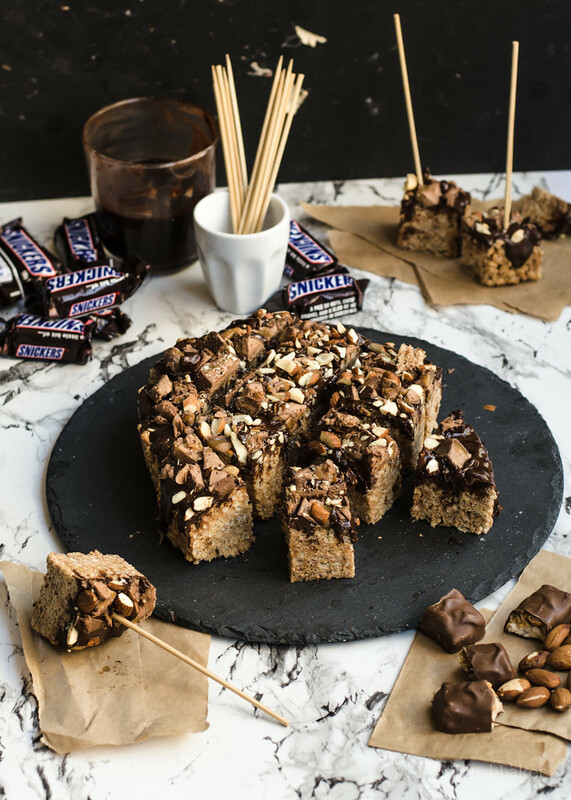 Finish with chopped snickers and extra nuts if using. Allow to set (or not! Warm chocolate is best) and cut in pieces. 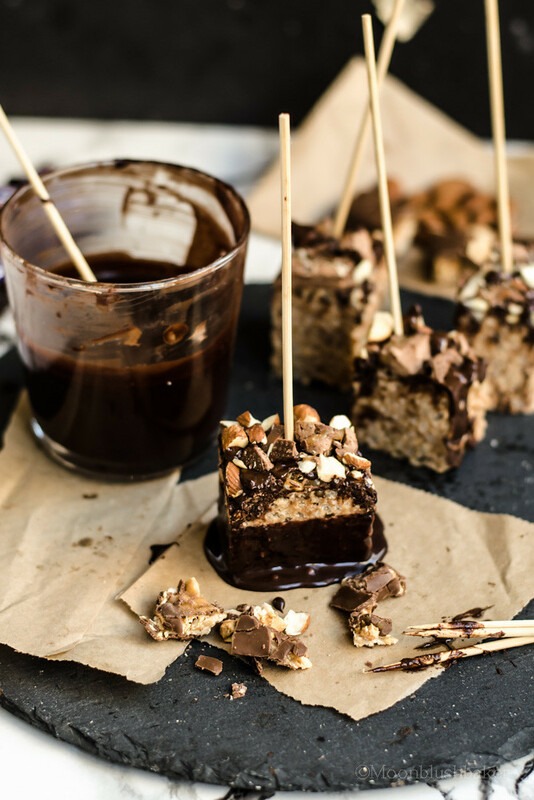 Serve on skewers with chocolate sauce. ohmygosh. this looks absolutely incredible. 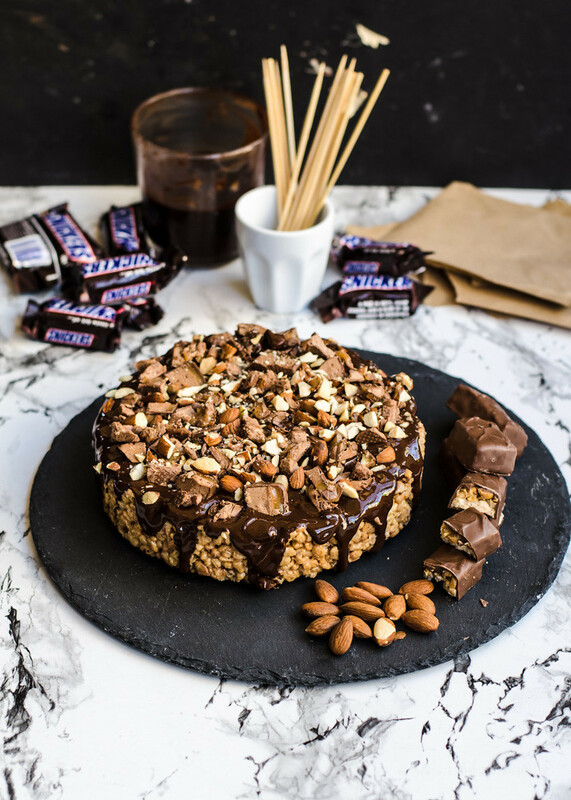 i haven’t had snickers in forever, but i definitely have a craving now!